Tonight I share my last homework piece. I am getting to like this technique that is so far out of my norm. Today, there was some serious coloring done for my homework card. Again, I didn't go as far as Kelly did, but I do love my card. There was masking involved, and a fab little trick that you can get if you take the class. It really helped my in my layout. I love pre-arranged flower stamps, making my own design is just such a trial. LOL. But I gave it a go and it worked out. Kelly did a lot of special things to her sample for day 4. I did not. I probably will the next time I give it a go just for fun. That is the thing I love about classes - those videos are there forever to be accessed long after the class is over. I loved Kelly's yellow into pink coloring - it is just striking somehow. The drawn line around the image gave me some fits...mine became bold and uneven on the sides ---but I am calling it artistic license. I added some spectrum glitter brush pen to the centers of the flowers. I am coming in at the last minute again to play with Muse. Kim has provided a darling card full of pups. I was inspired by all the pups, and I have a cat stamp that is of the same type. I stamped off the whole stamp, cut off the top portion - then used that as a mask as I inked up the bottom half of the stamp so I didn't have a full page of cats. This one is going to my Dad of course. One of his cats went missing a week ago...but made his way home 3 days later with an injury. Neither my Dad nor the Vet was sure what happened to him, but he's at home. Hes not happy with the cone head but he needs to leave his stitches alone. Below is a photo of Jack about a year ago. He was watching my hair and makeup routine. Its been a banner card making day - and this is the last of them for today. 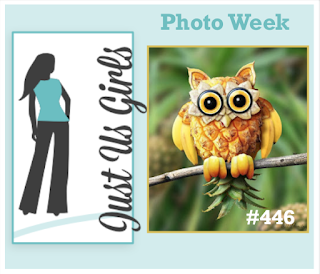 Two challenges have owls, and I need an encouragement card, so this worked out. The Card Concept and Just Us Girls inspired this card. I'm calling it clean and simple in style. I left a few swirls in the inking, I think it gives it a feeling of movement as if the owl just landed to impart wisdom. Masking, ink blending, and copic coloring were my techniques. It came together fairly quickly. I've missed the last two twofer challenges - the idea machine in my head went on strike. I feared I might miss another one - but at the last minute the strike ended. So I am happy to have cards for this Twofer Challenge. I've used a Close to my Heart set called Always Grateful. First time inking it up, and I think it will get a fair amount of use now that I have played with it a bit. Its has been a while since those Distress Inks of mine were used for ink blending and I pulled them out today to play. First up- Ink resist over heat embossed images. 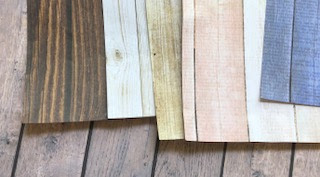 Used tea dye and walnut stain. Next up: masked off side and bottom, inked with shabby shutters and mowed lawn. Stamped over with versafine onyx black. Die cute and adhered to matching card base. When I saw Kelly's lesson for day three - it scared the you know what out of me. Loosey Goosey watercoloring with Distress Oxide Inks...oh help me now. Ya I have control issues. I like watercoloring but I want embossed lines so stuff stays where its supposed to be. So this lesson is WAY out of my comfort zone - and it should be. How can I learn if I don't try the out of my comfort zone techniques? I actually had fun once I let myself go. Ya! I might even make more in this style! And again this is supposed to be one layer wonders --- I just like mounting my one layer on a colored card-base. Thanks for coming by and indulging my homework show. At first this was not my favorite card of my homework. This assignment required a background stamp with open spaces, multi shade coloring of the background, some masking for the sentiment and a touch of glitter. Going through my stash, this is the best I could come up with. I'll be showing all the homework - even the less than happy outputs. Hard to see, but there are 3 shades of the yellow from light to darkest. Edited to add: Looking at the actual card again - it is growing on me. It is cute. The picture doesn't capture it well at all. 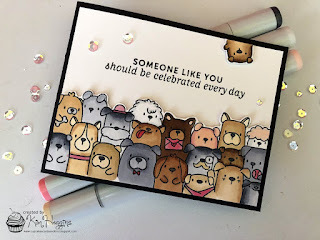 It has been at least a year since I took an online cardmaking class. Kelly Latevola is teaching a class over at Altenew Academy. Its a great price point, and the title is One Layer Wonders. I've long been a fan of Kelly's coloring - so I had to take this class. My homework will be a case of the day's lesson. I might have to switch out some stamps, but it will be very similar - so I cannot take any design credit. 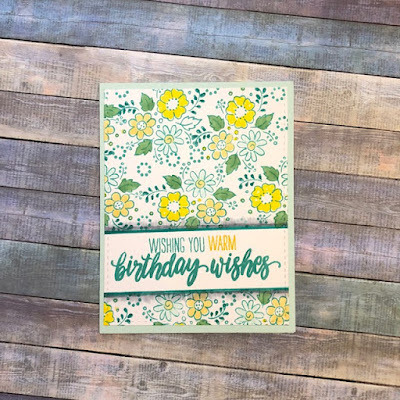 While my card is a focal panel layered on a colored base, the focal point is one layer. This was a fun and relaxing card to make---up until I made a wonky cut with the die. But, hey I am a little wonky too. SO I am going with the resulting slight banner tilt. 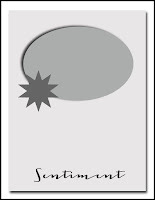 I really like the appearance of the raised sentiment banner across the card front. Its a cool trick. The interactive portion of class runs through 6/26/18. But of course you can take it anytime. The interactive portion is merely the chat options in the forums; the galleries appear to be open forever. Darnell posted a solution to the email comment issue, so you don't have to leave your self a comment anymore. I've done the steps and it works. Delete your email address and click on "Save Settings" in upper right. Re-enter your email address and click "Save Settings" again. You will then receive an email in your inbox from Blogger confirming that you want to subscribe. Click on the underlined word "Subscribe." Today I sat and sat and sat. My idea machine wasn't working. So I went to the challenges and hoped something would spark an idea. Thankfully two challenges came to my rescue. 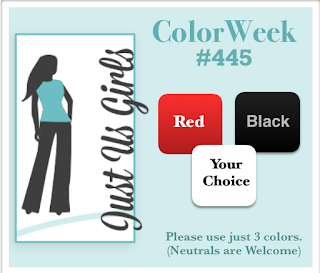 Just us Girls has a color challenge Red Black and participants choice. I'm adding green, counting white as a neutral. Addicted to stamps is on the Make your Mark week so I pulled out the copics for coloring my image from Hero Arts. I'm not generally a collage/stacker on my cards, but I love the way these pieces all layered up together. This month my bizarre day card is going to hubs. Its June 19th and its Kissing Day. He doesn't get a lot of cards from me anymore since we are living together and not separated by the continental US. So I think he'll enjoy the surprise. If you are interested in looking up other non-traditional holiday or "days" here is the link I use. 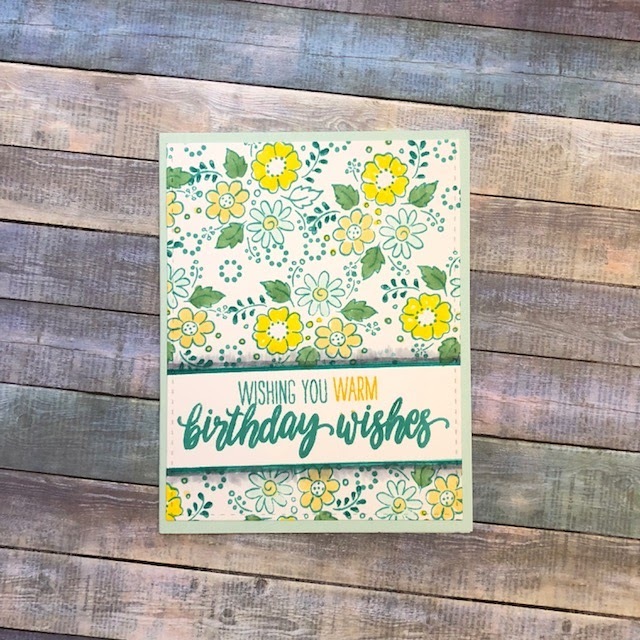 Another card with Altenew's Painted Flowers. This time using just the sketchy outline, and then coloring the interiors with prisma color pencils. I started with a light coat of white, then added two similar tones for the leaves and petals. 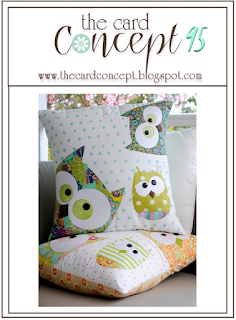 The design is inspired by the sketch at CAS Colours & Sketches, and the technique is inspired by Tracey's card at Muse. Both inspiration icons are below. I pulled out an old favorite today - Altenew's Painted Flowers. I used Altenew inks for the color as well. 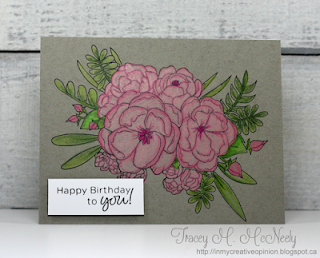 The pink blooms are diecut and adhered flat, the black and white are directly stamped on the card base. The sentiment comes from SU. 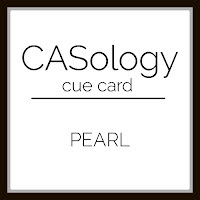 Casology 304 Pearl - There are many small pearl embellishments throughout the design. I'm home from our trip, and am dealing with a lingering cold. The usual tiredness, and a cough that for me takes about 2 weeks to clear up based on past colds. I am definitely on the upswing. My Dad gave me my belated birthday gift while I was visiting, so a thank you card is in order. He loves the kitty cat cards so thanks to a gift from my dear friend Betty - these Honey Bee Curious Kitties are getting some inking. While I was in California, I gave my Dad his Father's Day gift and card early, so this won't spoil the surprise. I'm entering it to Always Fun Challenges - Male Card/Dad. 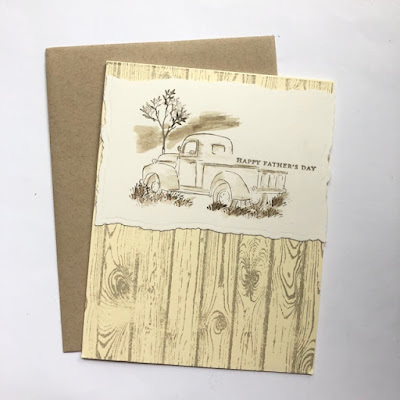 He really liked that old truck from Art Impressions along with the sepia toning of the card. Zig colored, copper embossed Mondo Sakura from Ellens. My Godson is graduating from college, and we headed to California to help celebrate his achievement. Unfortunately, hubs came down with a virus two days into our visit and yep two days later I had it too. Hubs is on the upswing feeling better each day. I hope I am feeling better each day too. I am heartsick to miss this graduation. I do hope I can catch it online if nothing else. I went for a more formal card in black and white. I love the Darice embossing folder - and to make sure those mortarboards embossed deeply I gave the paper a brief spritz of water before embossing. No sequins on the card - its a guy card, but a few in the picture to add to the festiveness. I recently picked up the wreath turnabout stamps from Concord and 9th. There was a learning curve for me. Apparently I had a hard time drawing the x's on the back of the stamps absolutely in line with the template. But after a couple of tries and a couple of colors of sharpies, I did manage to get it done. These stamps are kinda fun once you get the hang of them. Just a quick thank you card today. This card is for the May Card Chain Challenge; and it is going to Helen in Ohio. The last few I have sent overseas. 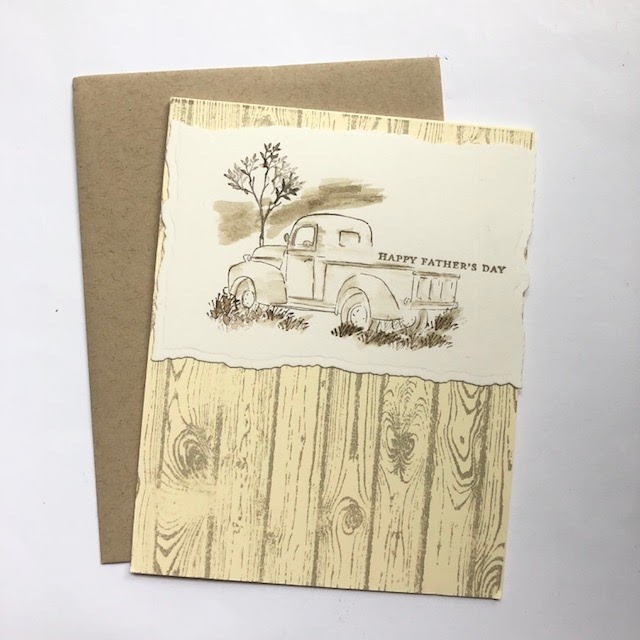 I also send along a few die cuts or stamped images when I send the card. Its fun to get a little something new to play with. I used the colors, the sketch (loosely - moved the sentiment) Flowers, and my image is from Taylored Expressions.